There are too many health benefits to name that are in this beet Vinegret salad. 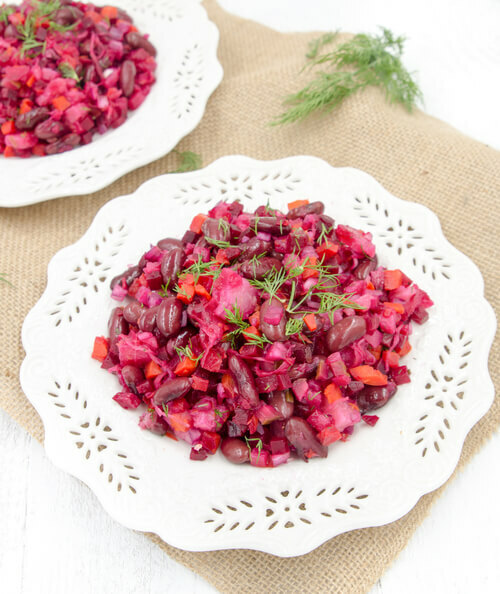 What makes the colors of this delicious salad is the powerful burgundy beet root. Beets are high in fiber, potassium, vitamin C and magnesium, all which are a big benefit to your bones, liver and kidney. Another ingredient in this version of vinegret is the sauerkraut. Sauerkraut gives a tangy taste to the salad, and a huge benefit to your body. It is great for your digestive health, strength to your bones, reduces cholesterol levels, eliminates inflammation and can even protect against certain cancer. Beet Vinegret will make a great addition to your upcoming holiday parties. Place beet, potato and carrot into a medium size pot and fill it up with 4 cups of water. On medium heat boil for 60 minutes, or until fork tender. Take out vegetables on a plate and let cool completely. Drain and rinse red kidney beans. Add to a big bowl. Cut, peel and cut cubed beets, potato, carrots, 2 pickles and 1/2 red onion. Add to the bowl. Add 1/2 cup of sauerkraut. When ready to serve, mix with sea salt and extra virgin olive oil to taste.